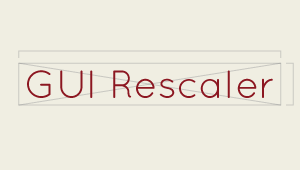 GUI Rescaler is an easy to use, yet powerful script that will automatically rescale GUIText and GUITextures so no stretching occurs, no matter what the aspect ratio is. Extremely useful for mobile developers looking for a quick solution to keep their GUI looking great on mobile devices of all shapes and sizes! Use this script on any GUIText and GUITexture and never worry about stretched text or images again.